Are you looking for a fun and easy craft to do? 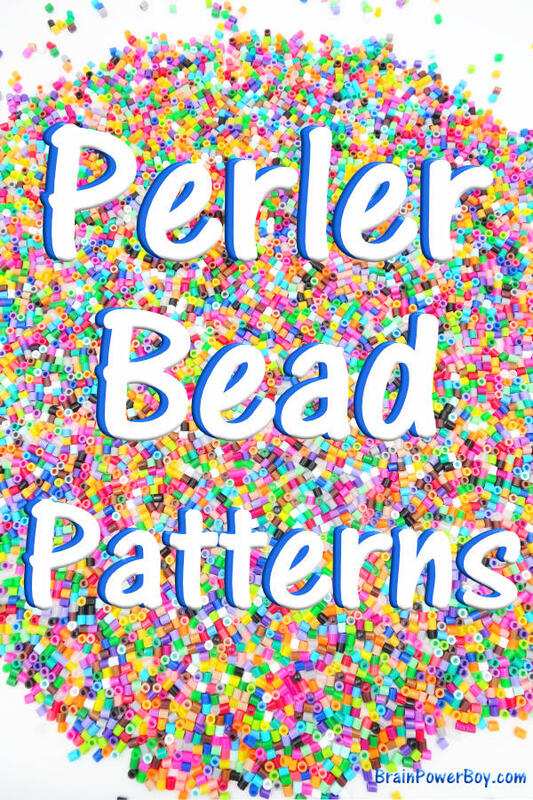 Try these Perler bead patterns. Creativity is the name of the game with these beads and you will enjoy making all sorts of designs. My son and I do these projects together so many of these are Perler bead ideas for boys and are boy friendly as is the rest of my site. We call this pixel art! If he enjoys crafting and/or likes to draw, he may very well like Perler beads. I suggest you give them a try. If you want to see all of our Perler Bead Ideas be sure the check them out when you are through reading this. We really enjoy the huge variety of colors to work with and like to make up our own patterns. We also want to share those pattern ideas with you! Here is what we designed and made so far. There are more to come! This is our page for all of our patterns. Pin it, stick it in Evernote, or bookmark it so you can refer back to it when you are looking for a project to do. This was the very first piece we put up on our site. Minecraft Perler Bead Skeleton which is also perfect for Halloween if you like your skeletons on the blocky side. Minecraft Perler Bead Steve is his most popular Mincraft Perler bead pattern. He is a classic. Minecraft Perler Bead Ghast is finished and on the site now. I designed 3 Pirate Perler Bead Patterns to Make. There is a pirate boy, a cool ship sailing the seas and a super neat (if I do say so myself) parrot who is colorful and fun to make. Arr! The Submarine Perler Bead Pattern was actually made for Submarine Day. It is a very easy to make design that is perfect for beginners or those who like submarines. I thought your boys might enjoy this one. For three fantasy projects with Perler or Hama beads try our D&D Perler Bead Patterns. There is a sword, a shield and a staff. When it came time to make our leprechaun trap this year we decided we wanted to try making a 3D Perler Bead leprechaun trap! It was really fun to design it as a little house shape with a door and to put Saint Patrick’s day designs on the four walls and the roof. Give it a try! While Halloween can be spooky and scary, it can also be fun and feature cute ideas. I hope you like these Halloween patterns as much as we enjoyed creating them for you! 5 Spooktacular Halloween Perler Bead Pattern Ideas features a bat with red eyes, a skull, a jack-o-lantern, a flying ghost and Frankenstein’s monster. Not too spooky, but spooktacular instead. Glow in the Dark Vampire will have you wanting to make a lot more glow in the dark projects. I know, because that is what happened to me 🙂 This vampire is really cool! This one if fun for Halloween but would also be good for a quick craft while learning about spiders and their webs. Our Glow in the Dark Spider and Spiderweb features a wonderful web that glows in the dark as well as a spider with a glowing abdomen. Ok, I admit it, these are simply some silly fun. Halloween Creatures wearing Top Hats happened because I was messing around and made a little cute spider and needed a couple of other creatures to go with him. They are all wearing top hats because . . . it really seemed like they needed them! If you want to know what supplies you need, or would like to see the ones we use and recommend, check out our Perler Bead Supplies: The Ultimate List article. I hope you enjoy making all. the. things! As I said earlier, these little beads are a whole lot of fun to work with. Let your kids make their own Perler Bead pattern ideas because that is part of the fun. Letting them use their imagination to make some of their favorite things out of beads is great for their creativity. I am always surprised to see what wonderful ideas kids come up with! And, if they need more ideas, be sure to stop back here to see what else we have created.